So I finally made it out to Torrisi Italian Specialties, the new culinary polyglot on the block (though, it's more like borough), this past Sunday evening with Alice and Sam, both whom I know from my hometown area. Back in September, Alice sent me this little Fashion & Food series write-up co-written by comedian, Aziz Ansari, and make-up artist, Annamarie Tendler, and after reading, we were thoroughly convinced we had to go. I felt like we had been talking about going for eons, when at one point, Alice just said, "We should just pick a date and go -- otherwise, we'll never get to go." So that's exactly what we did. The restaurant accepts reservations two months out, so at the end of February/the beginning of March, I got my foot in the door under Torrisi's online reservation system (via OpenTable, only available through its website), and we were all set to go on April 29. Chef Rich Torrisi and Chef Mario Carbone are the co-owners/chefs behind Torrisi Italian Specialties, along with business partner, Jeff Zalaznick. For the restaurant's background, I consulted Food & Wine magazine's feature on it back in December 2011. 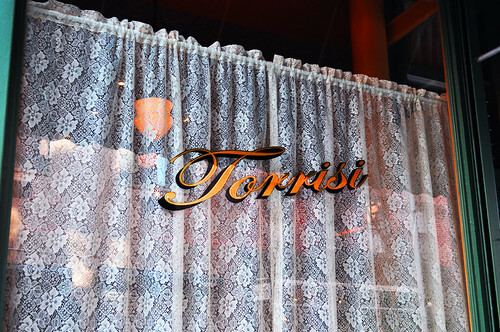 Before the latter part of 2011, Torrisi daylighted as an Italian-American delicatessen, which offered their signature dishes -- chicken parmesan and eggplant parmesan heroes. This lunchtime arrangement "served the dual purpose of allowing the chefs to acknowledge their paesano-boy roots and ensuring cash flow." The very same space transformed in the evening, moonlighting as a 25-seat restaurant. 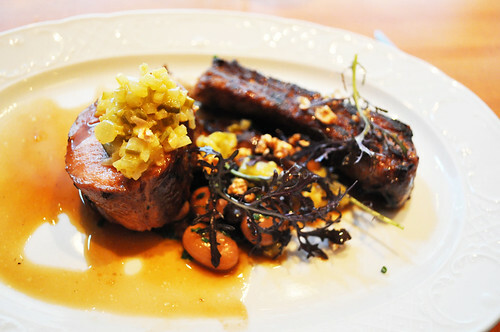 The "food remained unpretentious and Italian-American-inflected, yet it also showcased the haute training that the chefs had received from Chef Andrew Carmellini of Café Boulud at the time and Chef Mark Ladner of Del Posto." The restaurant's convenient location on Mulberry Street, right amidst the blended, gentrified neighborhoods of Little Italy and SoHo/Nolita, inspired the food to be "not only clever and wonderful but also an act of cultural repatriation." This is what the restaurant dubs as "Torrisi 1.0" -- i.e., the restaurant's initial evening phase. 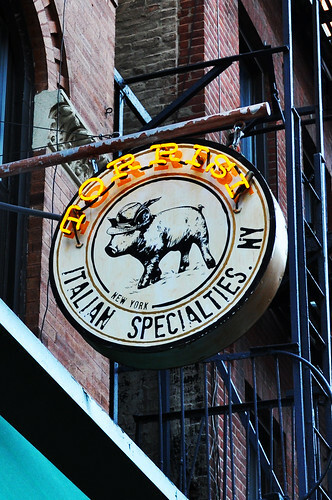 During early November 2011, the Torrisi family expanded its enterprise by opening Parm, where all of its sandwiches would now be made and sold, along with other "explicitly Italian-American items," including fried calamari, garlic knots, antipasti, and one "nightly special" entrée. With Parm offering its original classic fare, Torrisi Italian Specialties evolved into "a full-time prix fixe restaurant where the food isn't particularly Italian." The "1.0" menu continues to be available, but now the surrounding ambiance is a little more dressed up. But what's the most interesting is what the "2.0" menu entails. There is now a twenty-course tasting menu available for $125 per person, which requires special, phone-only reservations. 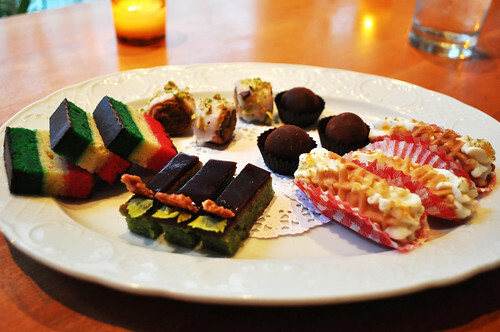 The tasting menu begins with very small plates (referred to as "bites" by the chefs) and continues with "tasting courses that veer all over the five boroughs, temporally and ethnographically." This was the natural evolution of the menu by Chef Torrisi and Chef Carbone -- the menu continued to "slip away" from Italian and "reflecting the polyglot influences of the surrounding neighborhood and the city in general." So essentially, Torrisi has become somewhat of a live culinary museum of iconic New York -- past, present, and possibly future. The chefs have used historical accounts like William Grimes's Appetite City: A Culinary History of New York and Judith Choate and James Canora's Dining at Delmonico's: The Story of America's Oldest Restaurant as sources of influence. Chef Torrisi even staged a couple stings with Chef René Redzepi of Noma in Denmark and with Chef Heston Blumenthal of The Fat Duck in England. As you can tell, this "new change" was not any old change. It was a drastic and amazing commitment made by the entire team to paint gastronomic landscapes of New York City's old and new haunts. Very admirable and impressive feat they set up for themselves. 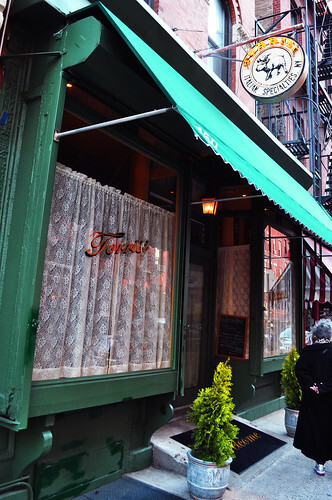 I love the classic Italian-American look that Torrisi boasts from the moment you come across its green exterior. The old-school cursive font matched with the curtains that remind you of an Italian grandmother -- yours or someone else's -- along with the vintage-inspired, circular emblem that glows above the storefront is so very Mulberry Street. It is the perfect façade for this very restaurant. I'm not sure exactly what I was expecting, but I was shocked to see how small the space was at Torrisi. The seating frames the restaurant's interior, with bar-like seating on the back left as well as facing the windows. At the center is a modest island for keeping tabs on reservations, for showcasing some flowers, and for holding wine bottles for the evening. Above the dining tables are wall shelves stocked with token Italian pantry goods -- Progresso bread crumbs, extra virgin olive oil, canned tomatoes, pasta, wine bottles, and the like. 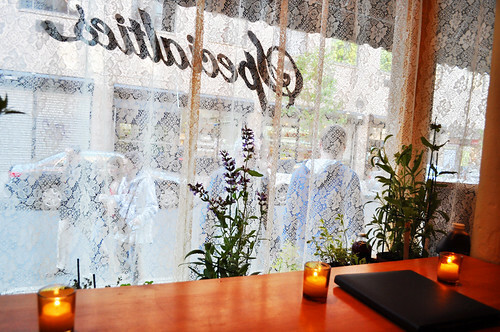 Our trio was seated at one of the window tables. There was a lot of interesting people-watching as they would walked past, attempting to peek in through the curtains to see what was up. Some even went to the lengths of putting their face up to the window, nose against the glass and all. It was quite interesting to say the least. We came for the prix fixe, seven-course menu, which includes four antipasti, a pasta, a choice of meat or fish, and Torrisi's signature cookie plate. There is only one menu every evening for this prix fixe, and unfortunately, no changes can be made for allergies or dietary restrictions. The other option ("2.o"), as I've already mentioned, is currently running at twenty courses. We thought that would be a little much for us, especially for our first visit, so we opted for the more abbreviated meal. The first of the antipasti (Course #1) was the warm mozzarella in DaVero extra virgin olive oil and toasted garlic bread sprinkled with chives. Since the antipasti dishes are served family style, we had two plates of the warm mozzarella to share. 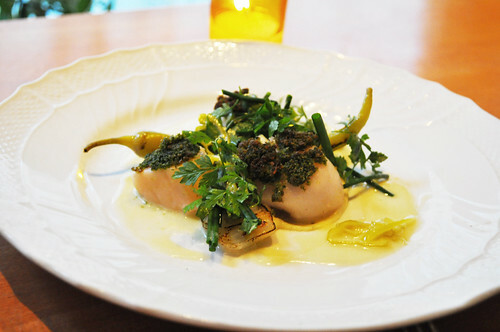 This is one of Torrisi's signature dishes. This fresh mozzarella, served warm, is made in house, and it is unbelievably soft and delicious. You won't know what you've been missing out on until you cut a bit of this and eat it over the accompanying garlic toasts. You may never want to ever eat any other cheeses besides the homemade kind again. The mozzarella's creamy yet lightly structured texture absorbed the olive oil very nicely, melding right onto the toasts for the perfect delectable bite. Needless to say, both bowls of warm mozzarella were gone by the time our next course was due to be served. Just wished we had more toast to eat with it, though surprisingly enough, the cheese was easy to eat straight up, too. Instantly winning dish, hands down -- I believe this is served at every "1.0" dinner. Additionally, after having such wonderfully made warm mozzarella, now I can't say mozzarella like an American anymore -- I have to be a little snobby and say it the Italian way. It just doesn't seem right to butcher such a beautiful specimen of lovely curds with my American ways. Next up were the miniature sesame bagels with ramp cream cheese, capers, sliced cherry tomatoes, cucumbers, and dill. This was a miniature homage to the New York City bagel (quite literally, too) with some schmear, but not just any old schmear. 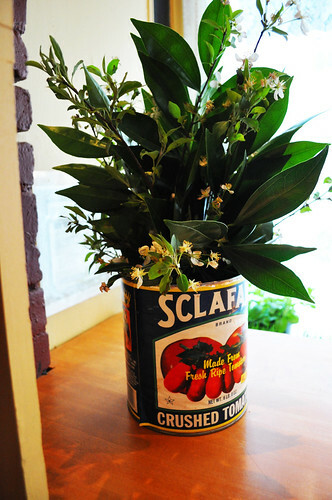 The cream cheese was made with ramps, i.e., baby leeks, which are in high season and demand as of late. The bagels were lovely, especially with the ramp cream cheese and the accompanying accoutrement. I wish I could've taken that spread home with me -- it would go great on just about anything! The third antipasti was the raw fluke with pepperoncini, sliced radish, and chives. This was a nice break from the starchiness (no complaints at all though!) 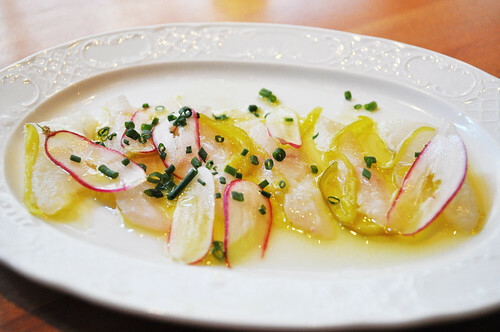 from the previous two courses -- refreshing as most seafood crudo usually are. The pepperoncini, vinegary and sharp in taste, gave it a slight Italian flair, while the radish helped to absorb the intensity. The last antipasti was "Hearts" -- beef tartare with vegetables hearts (including hearts of palm on the side), croutons, crispy anchovies. I thought this was a playful play on words, because you're half-expecting the meat to be an organ heart, but instead it's the veggies. I wasn't sure what to make of this dish -- the sprout hearts and crispy anchovies gave way for a contrasting texture to the soft and tender tartare of beef. There wasn't any need for bread to contrast the richness as the croutons were crushed right into it. 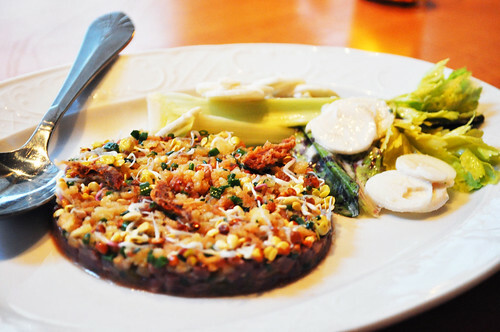 I've never had a tartare like this one -- it's just so different than what is offered typically. All in all, it was enjoyable to experience. 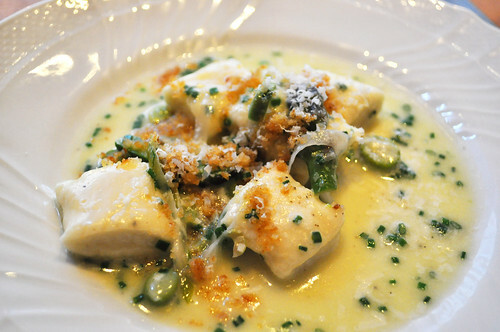 The fifth course (i.e., the "pasta") was Coach goat's milk ricotta gnocchi with fresh garbanzos and asparagus. For someone who isn't too crazy about goat cheese, I was concerned that this would be a little overwhelming with gaminess and cheesiness. However, it was a pleasant surprise that it was light for a creamy, gnocchi pasta. These pillows of potato were velvety and lush with rich goat's milk -- it being homemade made it even more spectacular. There were toasted bread crumbs sprinkled in to offset with a crunchy texture. The asparagus bits were crisp, and the thinnest layer of cheese melted on atop gave the dish a nice balance. For the main course, Sam decided on diver scallops francese with peppers, herbs, and potatoes. Even with its dainty and delicate presentation -- you almost didn't want to disturb it -- these diver scallops were perfectly cooked with whatever minced herbs were carefully painted on top. Very nice overall. Alice and I went with the alternative main course -- the Yankee pork roast with mustard, relish, baked beans, and crackerjacks. This entire dish is a culinary pun -- a play on ingredients with the New York Yankees because of the "Yankee" tagged to the kind of pork roast. The name comes from the frugality and practicality of the pork roast recipe as well as of its New England origins. The chefs added the crackerjacks and the mustard/relish as playful odes to the navy and white pinstriped ballplayers. While I wasn't totally gaga over the mustard-relish, the pork roast itself was unbelievable. It was perfectly cooked to the ideal temperature, allowing the meat to be super tender and soft. Whatever marinade that was used while roasting made it really flavorful, and the chop on the bone was really juicy as well. What I most admired about this dish was that it wasn't over the top -- it was simple and pragmatic, ingredient-wise and preparation-wise. Just goes to show that you don't need a crazy display to show a kitchen's/restaurant's talent. With that being said, I devoured right through the pork roast, wishing I had more to savor after the last bite. 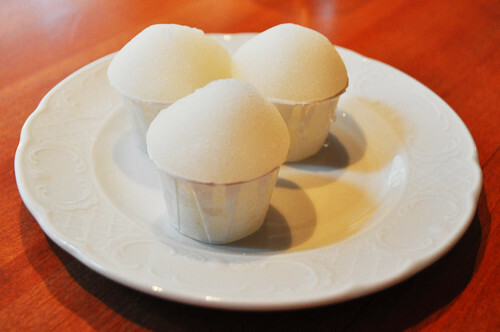 Before the last course (i.e., dessert), we were given somewhat of a palate cleanser -- a lemon-ginger Italian ice. This was quite tart (in a refreshing way), and the ginger was a tad bit punchy on the palate, certainly cleansing our palates! I also liked that the Italian ice being served in miniature pleated paper cups, the ones in which you typically find it served. It was a fitting touch. 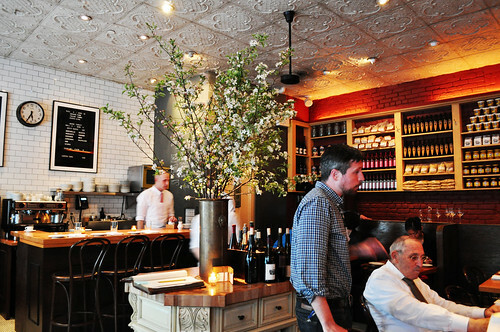 Findings: Overall, we very much enjoyed our multi-course dinner at Torrisi Italian Specialties. Chef Rich Torrisi and Chef Mario Carbone certainly have something special cooking over in this intimate little restaurant on the northern end of Mulberry Street. There wasn't really anything that I didn't like -- I thought everything was stellar. The vignettes created on each plate undoubtedly showcased the talent behind Torrisi's kitchen. I admired both the simplicity of the dishes as well as the amazing execution behind each one. The warm mozzarella alone deserves a standing ovation. I also like that the menu drastically changes each week, making a subsequent visit to the restaurant almost a completely new one, without having to wait the next season for a "new" menu. I would love to return a little more ambitiously and attempt to eat through the chef's tasting of twenty courses. After reading about the chefs' philosophies behind the "2.0 menu," my curiosity got the best of me. I'm a sucker for history, especially when it involves stories behind a given dish, so I think I would find it fascinating and intellectually stimulating. So if you want an iconic, New York restaurant experience (past, present, and possibly future), Torrisi will be your best bet. Reservations go fast, so plan accordingly -- whether it be two months ahead for the seven-course prix fixe (online or via phone) or for the special chef's tasting (via phone only). You surely won't be disappointed. Price point: $65 per person for a seven-course tasting menu.